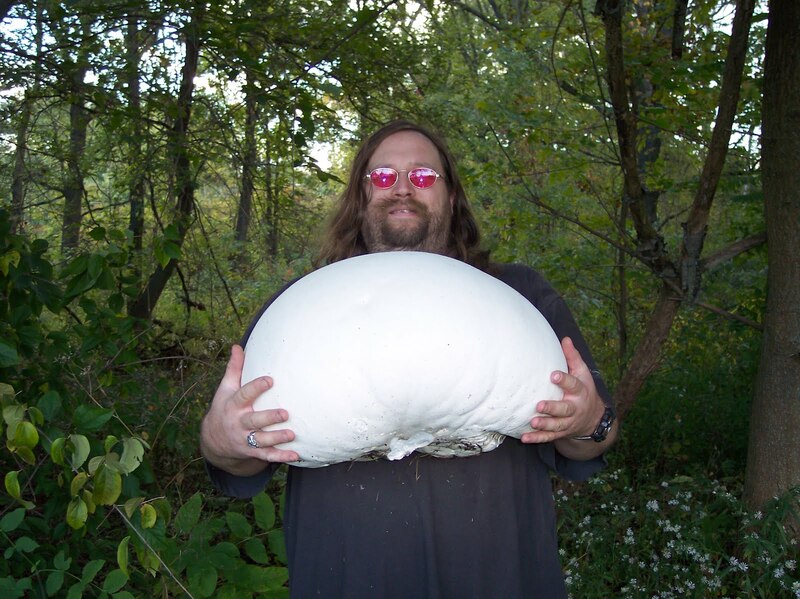 The familiar field mushroom Agaricus arvensis, photographed by Fred Stevens. Autumn being the height of mushroom season, it is appropriate that mushrooms should be my subject today. Recent years have seen great advances in our understanding of fungal evoluton: you could almost say our knowledge has mushroomed. The great majority of the macroscopic fungi that most people would be familiar with belong to the clade of dikaryotic fungi, so called for their production of dikaryotic (double-nucleate) hyphae. When these fungi reproduce, separate hyphae fuse to form a hypha containing nuclei from both parents, like a sperm fusing to an egg in human fertilisation. However, unlike a sperm and an egg, the parent nuclei do not immediately fuse. Instead, the resulting dikaryotic hypha grows and divides, and the nuclei divide within it while remaining separate from each other. It is the dikaryotic hyphae that produce the fruiting bodies of the fungus, so when you look at a mushroom you are not looking at the product of a single individual but of two conjoined individuals working in concert. Fusion of the nuclei for sexual reproduction will only take place when the actual spores are produced. View of a basidium (left) and ascus (right), from here. Within the dikaryotic fungi there are two main lineages, the ascomycetes and the basidiomycetes. 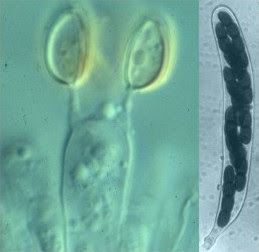 The two are distinguished by how their spores are produced, as shown in the photos above: in ascomycetes, groups of spores are produced within a sac called an ascus, while in basidiomycetes they are produced on top of a 'pedestal' called a basidium. 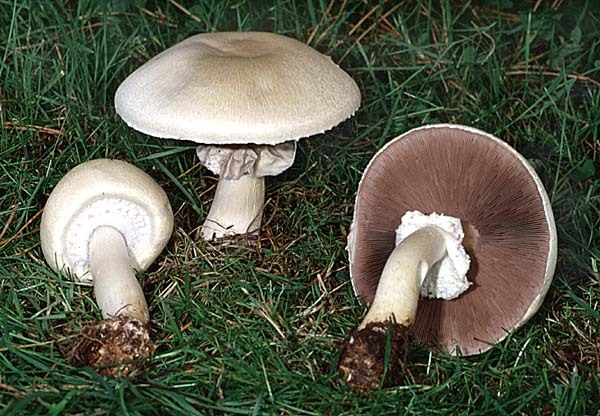 Ascomycetes are by far the more diverse of the two lineages, but basidiomycetes (such as mushrooms) probably include more familiar members because less ascomycetes produce large visible fruiting bodies (examples of well-known ascomycetes include morels, truffles and most lichens). Within the basidiomycetes, most macroscopic forms belong to a group called the Agaricomycotina or hymenomycetes. The other basidiomycete lineages include parasitic forms such as rusts and smuts, and a wide range of yeasts. Chantarelles Cantharellus cibarius, photographed by Strobilomyces. 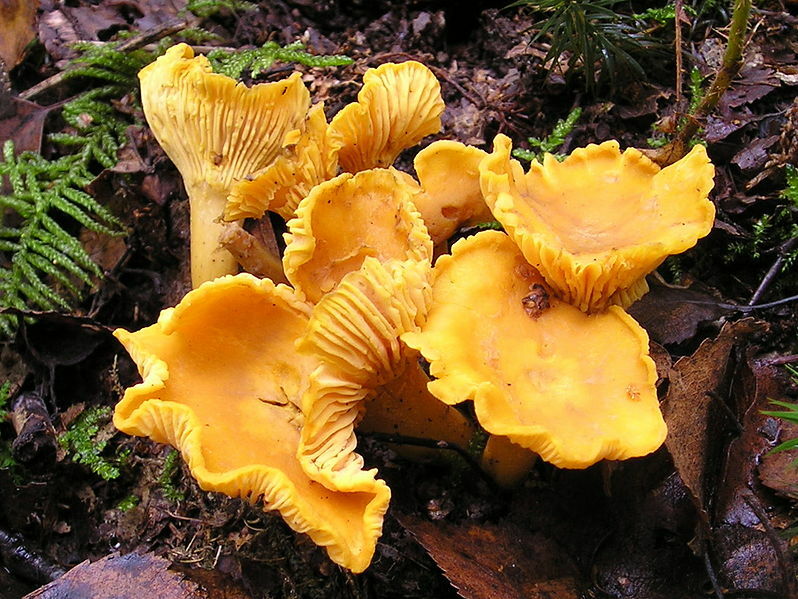 Chantarelles differ from mushrooms in lacking true gills; instead, they have 'false gills' formed from folds of the reproductive membranes that are not divided from the main fruiting body. These distinctions were recognised some time ago, but recent years have seen a shake-up within the Agaricomycotina. Earlier authors divided this group between the heterobasidiomycetes, in which the basidia are divided by internal septa, and the homobasidiomycetes, in which the basidia are not divided. Mushrooms belong to the homobasidiomycetes; heterobasidiomycetes are a bit more obscure, but representatives include 'jelly fungi' with gelatinous fruiting bodies, such as the edible wood-ear fungus Auricularia auricula-judae. Phylogenetic studies have confirmed, however, that the heterobasidiomycetes are paraphyletic with regard to the homobasidiomycetes (Hibbett 2006). What was perhaps more surprising, though, is that the homobasidiomycetes appear to be polyphyletic: one basal clade, the Cantharellales (including the chanterelles and hedgehog fungi), includes both 'heterobasidiomycetes' and 'homobasidiomycetes', and is phylogenetically distinct from the clade including the remaining 'homobasidiomycetes'. As a result, recent authors have mostly not recognised homobasidiomycetes as a formal taxon, but instead referred to the clade of Agaricomycetes including homobasidiomycetes and a few closely related heterobasidiomycetous taxa. The flower fungus Aseroe rubra, photographed by Hugh Smith. As well as familiar gilled mushrooms, Agaricomycetes include such diverse forms as puffballs, stinkhorns, bracket fungi, earthstars, boletes,... Some of the more unusual forms even include false truffles, or marine taxa producing underwater fruiting bodies (Hibbett 2007). Molecular phylogenetic studies have recognised a dozen or more major lineages within the Agaricomycetes, some of which were unexpected. Many of the latter include lineages dominated by so-called resupinate forms that do not form well-developed fruiting bodies but instead generally form an undifferentiated crust; molecular studies have revealed a previously unsuspected diversity among such morphologically simple taxa. Phylogenetic studies have also confirmed the polyphyletic origins of the so-called 'gasteromycetes', forms such as puffballs in which spores are produced internally within the fruiting body and only released when the tissues of the fruiting body break down. Other results, however, have corroborated morphological expectations: one prominent example being the Russulales, a lineage whose members produce fruiting bodies varying from mushroom-like to truffle-like, but united by the production of latex within the fruiting bodies giving them a distinct chalky texture. Giant puffball Calvatia gigantea, from here. Hibbett, D. S. 2006. A phylogenetic overview of the Agaricomycotina. Mycologia 98 (6): 917-925. Hibbett, D. S. 2007. After the gold rush, or before the flood? 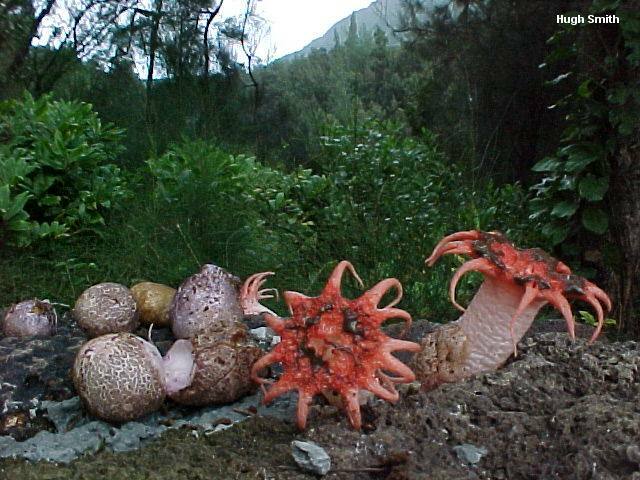 Evolutionary morphology of mushroom-forming fungi (Agaricomycetes) in the early 21st century. Mycological Research 111: 1001-1018.